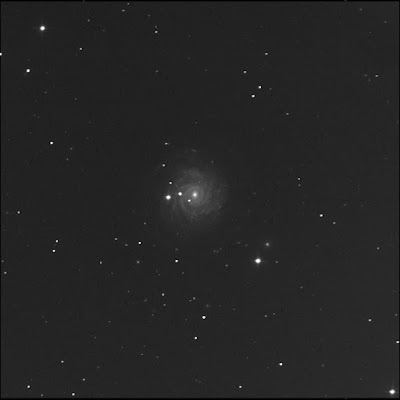 The Burke-Gaffney robot imaged NGC 3344. A face-on galaxy in Leo Minor. One of the RASC Finest NGCs. To the north-west, near the top-right corner of the image, is a small oval fuzzy. LEDA 1723912 is just east of the star J104244.5+250255. There is a sprinkling of tiny fuzzy points to the west of the big galaxy but these are not identified in SkyTools 3 Pro. I see a bright round lint ball to the west-south-west of 3344, up and right of the bright star SAO 81487. An elliptical galaxy perhaps. LEDA 1718878. LEDA 1718826 and LEDA 1718896 are north-east of the bright star, between it and the galaxy. 1718826 is further away from the spiral, closest to the star, and is very small. The size of nearby stars but with a soft appearance. 1718896 has a slight oval shape. There are more unmarked distant galaxies to the south. For example, I see an oval where ST3P says J104326.4+244844 is located. LEDA 1717186 is to the south-south-east of NGC 3344 and east of the star GSC 01977-0705. A tiny canted almond shape. LEDA 1718221 is south-east of 3344 and due south of GSC 01977-0730. Nearly perfectly round. Very small again. Tiny round LEDA 1719450 is due east of the large spiral, at the edge of the frame, just beyond GSC 01977-0846. 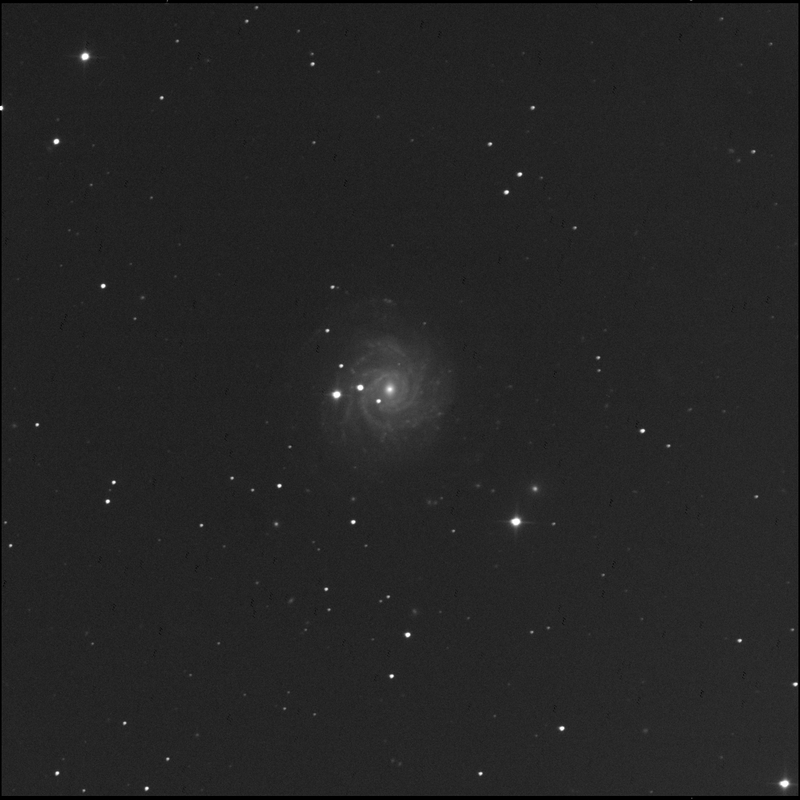 Another small round fuzz shows east-north-east of NGC 3344. LEDA 1721382 is just west of GSC 01977-0899. I think, overall, I can see another dozen galaxies in this image. Immediately left or east of the galaxy core is the bright, wide double star SAO 81492. The A member is superimposed over an outer arm of the spiral; B is between it and the bright hub of the wheel.